Why Esha Deol of all people? I know! But come on its her wedding and its the first and last time you will see her here. I was waiting for her to get married so I could post all her outfits in one place. And man it was sooo difficult to find the “exclusive” photos of her wedding! 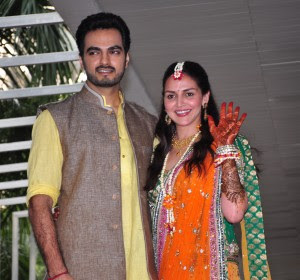 Esha Deol and Bharat Takhtani tied the knot today morning at the Iskcon Temple, Mumbai. Both Esha’s lehenga and Bharat’s sherwani were designed by Neeta Lulla. 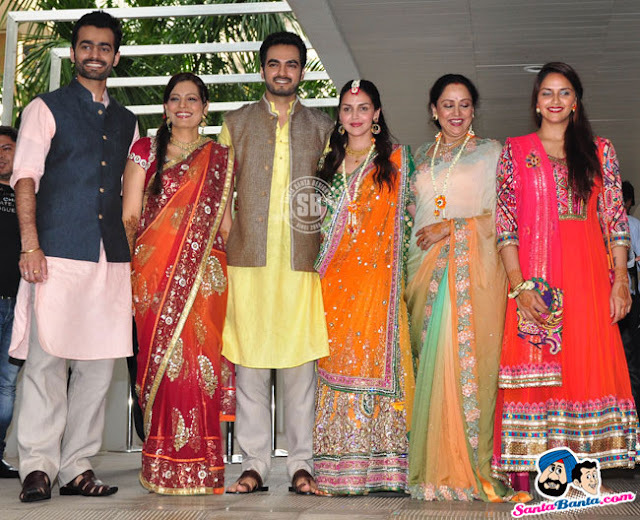 Hema Malini wore a Kanjeevaram saree as she said “all the Kanjeevarams are for the wedding”! The Mehendi Ceremony Party took place at the Royalty Club in Bandra, Mumbai on June 27. Here again Esha wore a Neeta Lulla yellow-green lehenga. Although it was a “private” affair, almost all of Bollywood turned out at the ceremony. Here are the Deol girls you see above. I like Esha’s sister Ahana’s neon outfit! I’ve seen neon dresses, pants, shoes but an Indian traditional neon suit! Here is the designer herself in a light yellow lehenga – Neeta Lulla. I like the colour, nothing else. Of all her outfits, I liked her engagement outfit the best. She wore a light pink heavely embroidered saree with a parrot green blouse. They both look quite happy here! 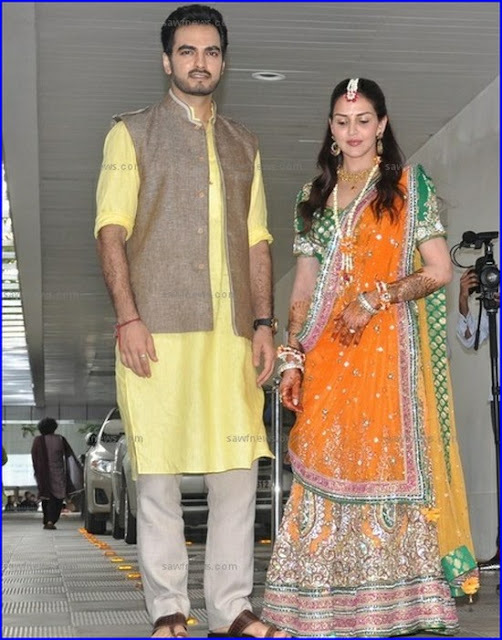 She wore a Rocky S orange lehenga for the Sangeet ceremony. What caught my attention was the pearl waist belt. Indian brides WITH a waist belt look no less then apsaras, right? What do you think about her? The outfits were nothing special IMO but then she is a happy bride and that’s what matters at the end of the day. PS- I don’t own any of the images. All of them are from google images. the waist belt is very pretty as you pointed out. i liked only here sangeet outfit… even then felt the color combination cud have been better..
wat an ill-fitting blouse in tat pink saree-parrot green blouse.. even we dont wear tat ill-fitting ones to shop for grocery! as pointed out.. neeta lulla’s suit shade is really pleasing…. 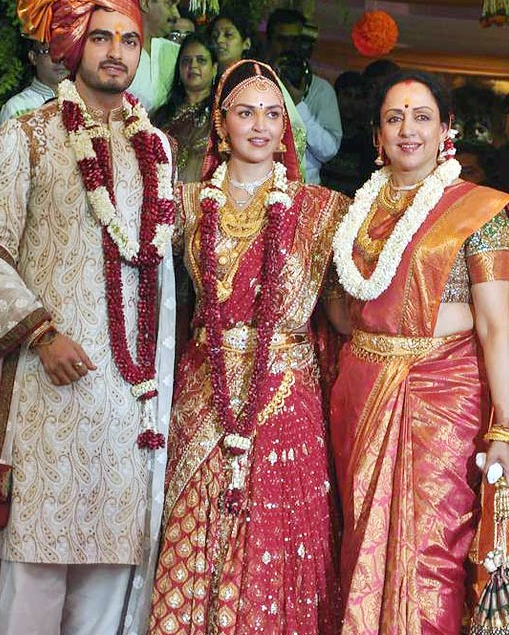 Well, its totally understandable for her to having a wedding like that with outfits like that cause of her mother being very “traditional” in a series sort of way and Esha Deol brought up like that of course she would go with RED heavy sarees and all that. She was totally a 2000’s heroin for me LOL. Wish her all the best and happiness. Big fan of her mum’s old movies lol. Congratulations to the newly wed couple! Best wishes! It was nice of Abhay Deol to be present for the wedding, when Sunny and Bobby were not there. Best of Luck to them. I loved her sangeet dress! Ive never liked Neeta Lulla’s outfits…dunno why these stars like her so much..even though her outfits were nothing great, her happiness shines through..wish them both a happy married life. I was also expecting quite an action in the Deol-Takhtani wedding looking at the front page bombay times article a few days before the wedding. Should say I was disappointed – with the make up, the trousseau, the family attire, everything. But you rightly said – she was a happy bride and thats what matters! Weddings are a great time to bond with family and go shopping! Uncut diamonds are a symbol of wedding bells and I could give credit to one of my favourite jewellery stores, Mangatrai Neeraj in Hyderabad. They have a great collection for any kind of lehengas or wedding outfits.